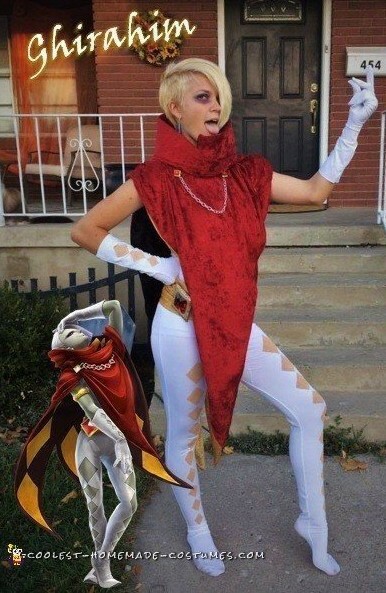 This Lord Ghirahim costume is one of my my favorites because I didn’t think it would turn out as good as it did. The white body suit is a plain white zentai suit that had a full head and hands, it was $20 on eBay. I cut the body suit to match the character’s costume, cut the lower arms into the gloves, cut a triangle in the belly. No need to finish the edges, they don’t fray when cut. Since a girl wore this I skipped the chest triangle. I had to cut across the back zipper, just tape the ends before you try to zip it up or you’ll lose your zipper and thats the end. I didn’t want to do the green skin to minimize makeup. The diamonds on the legs and the gloves are painted on by hand. I found 3 colors of acrylic paint to mix to match my daughter’s skin tone – a tan, dark brown and a pink. Paint them while the wearer is in the suit or they will stretch and crack. Paint will go through the fabric, but acrylic washes off skin easy. Let it dry before taking it off, a hair dryer helps. Some stretch panne velvet in gold, black, and dark red make the rest. The sash is a strip of gold sewn into a circle, it slips on and stays because it is stretch material. The cloak was complicated, but if you stare at photos enough you figure out it is made in 3 pieces. The two right/left points in the back are the bottom piece. It connects with the drape acorss the chest. The middle points, front and back, are one piece, like a giant diamond with a hole in the middle. The collar I made separately and velcro’d it on. Piecing stretch velvet is hard, it constantly stretches and morphs shape, and you don’t notice the black/gold diamond underneath as much when the rules of gravity apply, unlike the game… I kind of wish I had skipped the black/gold diamonds and just done all red, because you lose some fabric when you piece the diamonds and its hard to match up to the red again and the drape ends up a little off. All red wouldn’t have made a difference. Anyway, I did skip the diamonds in the collar and just go all red. The collar is one long piece, thick on one end and tapers, wrapped into a tube and sewn together at the points. It has thick foam batting in it to keep it standing up. It velcros to the top piece – the piece with the middle points. My daughter has Ghirahim hair already. I made a large earring out of a blue chandelier crystal I found on eBay. Silver chain from the craft store and two square buttons in front finish the cloak. The diamond gem on the hip is a piece of foam spray painted gold and accent painted with glitter nail polish. You can buy the large red rhinestone on Etsy. I glued it onto the foam with super glue, hot glue would ruin the mirror backing. I glued an old pin to the back to attach it to the belt/sash. Total time spent on this Lord Ghirahim costume was maybe 6 total hours. The majority of time went to the cloak – especially depending on how fancy you get with the diamond piecing. 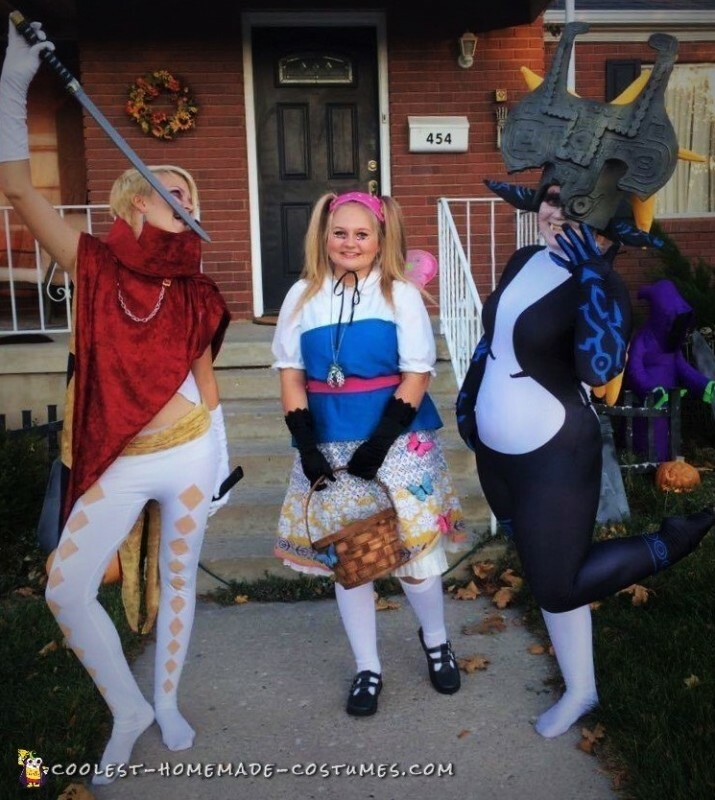 My kids did a group thing with other Zelda characters and they had a lot of fun. They plan to wear these to Comic Con, too, so multiple wears makes it worth while!